3M (MMM) is launching a $12B stock buyback program that will replace the diversified-machinery company’s existing authorization and is good for repurchasing 14% of its outstanding shares. 3M spent $5.2B on buybacks in 2013, including $1.7B just in Q4. Will the firm issue new debt to pay for additional repurchases? It ended Q4 with $4.9B in cash/investments and $6B in debt. If you were a financial advisor to MMM, would you recommend that they continue/expand their share buyback program? It seems to me that if the long term after tax cost to borrow exceeds the dividend yield then buybacks are not a good idea. Looking at the numbers that seems to be the case. In addition, I view 3M as over-priced at the current quote of $128/share [2/5/14 intra-day price]. Morningstar rates 3M @ 2 stars, which suggests that it is over-priced. They call FV @ $120. The 52 week range is $101 to $140. Yes, it is down from the high, but I see is as too expensive to buy back at current prices. In non-financial terms,3M has always been known as an innovator. You would think that an innovative company could find opportunities to profitably grow the company for the long term benefit of the stockholders. By the way,I’m not a fan of buybacks. Firstly, it is a financial engineering fad – everyone is doing it – so we must follow. Secondly, to me, it signals a company that is stagnating and can’t find opportunities for quality internal growth. Here is one rational for why borrowing to buy back shares makes sense. Lets assume the CEO’s compensation is based upon EPS achieved. i.e. Stock options. So if MMM borrows $12B at an interest rate of 4% the annual interest to be paid would be about $480M. They could expense about 30% of this as a tax deduction so the real cost would be about $336M. The PTPM of MMM is about 21%. So MMM would borrow money at 4% and with a PTPM of 21% this would provide a substantial boost to EPS. If MMM bought back shares at $130 the $12B would buy back about 92M shares or about 13.7% of outstanding shares. This would seem to boost 2014 EPS to about $7.64 even without any additional EPS growth from the company. The CEO makes a hefty profit and in case the board does not think this is a good idea the CEO arranges for the board to obtain some stock options as well. Also the shareholders now own a larger piece of the MMM pie. So everyone is happy. Now some may say borrowing $12B, raising the total MMM debt to about $18B may sound like taking excessive risk. However others may counter with the MMM business being a very stable business generating about $4B in FCF per year and taking on more debt is simply reasonably increasing the leverage to enhance shareholder returns since share prices are usually based upon EPS growth. I do admit $2B sounds like a very large number but then I notice MMM at a recent analysts meeting indicated they would spend $13B to $22B from 2013 thru 2017. You both get Nobel Prize nominations! I think we have consensus here … and a pretty solid example of a buyback strategy gone astray. As Dan mentioned, the executive compensation algorithms could be a factor. And, to me, that’s a little like the tail wagging the dog. It shouldn’t be possible for Capital Structure gymnastics to affect the outcome. The all-knowing consultants who build these packages need to take a step back. Turn the metric into something a little immune to gymnastics. For example, if it were based on % net margin, the whole buyback shell game charade with EPS goes out the window. We’ll leave the notion of “EPS Growth” for another day. Suffice to say, Cy Lynch is right. George Nicholson and Ben Graham were also right about an emphasis/vigilance on profitability characteristics and trends. But we don’t have to complicate things. If we believe that 3M has something on the order of 5% top line growth and 14% net margins (P/E ~ 15x) the return forecast (PAR) is 4%. That’s a whole lot closer to a sell than a buy. That’s right … when PAR is low, 3M should be selling shares, not buying them! 3M’s effective interest rate is 3.96% ($140 mil / $3533 mil long-term debt) and they may be able to get an interest rate somewhere between 0-4% and improve that effective interest rate a tad. LTD is 17% of total capital now. They have $3 billion in cash assets and $13B in current assets … and Dan is right, the cash flow is formidable. But another $12B??? 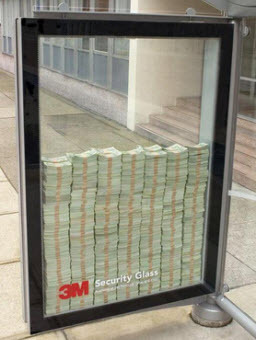 I think 3M management should proceed immediately to White Bear Lake. Do NOT pass Go. Do NOT collect $200. Chop a hole in the ice. (There will probably be a bunch of ice fisherman there, borrow an auger.) Jump in. Repeat until you come to your senses.